Napsali o nás | Everlift s.r.o. 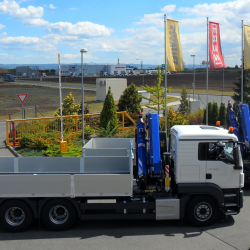 Two Fassi loader cranes, model F365A.2.26, for the construction company HOCHTIEF CZ a.s. The construction company HOCHTIEF is leader in its field. Currently, it employs approximately 1100 employees who are involved on the constructions in the several segments of this market in the whole Czech Republic. These may be residential, public and office, industrial, environmental and water management constructions, including projects of transport.